Three luxurious guest hand towels of superlative quality! These lovely towels are loomed of a weighty but very silken pure white linen damask with an overall motif of polka dots and a border frieze with festoons of floral wreaths and fleurs de lys. 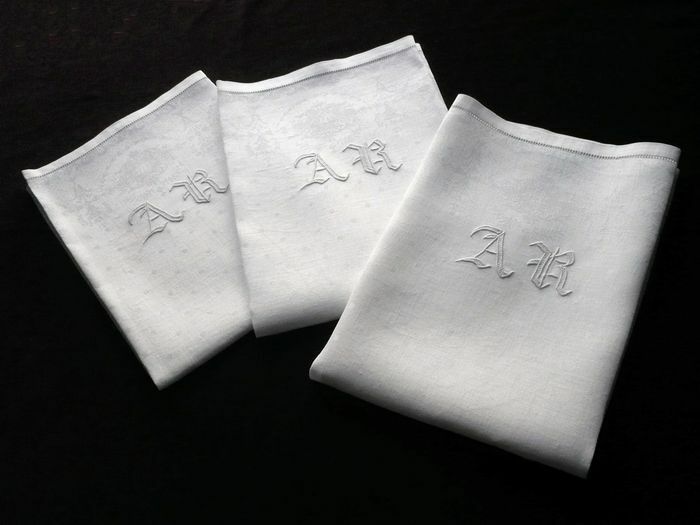 A magnificent Germanic style monogram, "AR," is embroidered with unusual relief and finesse in bourdon and post point at one extremity of each towel and the hems are finished with an elegant row of drawn thread embroidery. These stunning towels likely date from the early 20th century and are in impeccable condition. A second set of three identical towels is available upon request. Dimensions: 26 x 25in.